Drive protein skimmers and wet/dry filters. Drive undergravel filters (provide superior flow rates through gravel bed). Mix and prepare water for partial water changes (ideal for mixing salt water). Provide current for reef tanks and other applications (easy to hide in rock structure). Attach to Quick Filters for additional chemical and/or mechanical filtration (ideal for clearing cloudy water in combination with PClear). Increase oxygen level (position output to move water surface). Back-flushing of gravel for maintenance with 402 and 802 (Reverse Flow Feature). 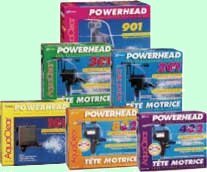 Powerheads provide a superior method of driving undergravel filters, helping to improve biological filtration efficiency through optimal flow rates and greater oxygen levels. AquaClear Powerheads require little maintenance other than periodic cleaning of the impeller and its housing, and provide trouble free long-term performance. AquaClear Powerhead Undergravel Filter Pumps increase flow rates for greater water movement and higher oxygen levels. Pumps are versatile devices which can be used for a variety of purposes in aquariums. 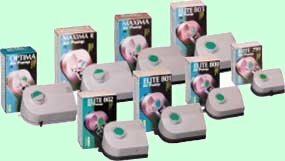 They are used to power inside box filters, sponge filters, undergravel filters, airstones, aerating ornaments, and provide oxygenation by moving water to the surface. It is important to understand that a pump introduces ambient air into the aquarium. Consider any sources of airborne pollutants to be potentially harmful. To obtain maximum longevity and performance from your air pump, avoid restricting a pump�s output. Use a gang valve which provides one more outlet than the objects to be driven. This will allow extra output to be vented, and back pressure will be avoided. When using airstones, it is recommended to replace them on a regular basis, which will prevent unnecessary back pressure. Always use a check valve to prevent any water from back siphoning into the air pump. Periodically verify that it functions correctly and replace it if necessary. Fluval Underwater Filters provide easy, convenient filtration, and have the capacity to independently filter aquariums up to 57 U.S. gal. (215 L) capacity. 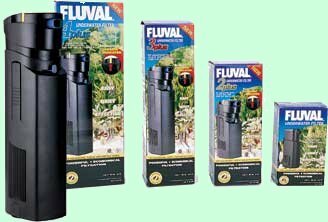 The Fluval "Plus" underwater filters feature a clogging indicator, allowing visual indication of when maintenance is required, and a cartridge design which prolongs service intervals. Vertical or horizontal filter placement. Can be used to create waterfalls in turtle and reptile tanks. 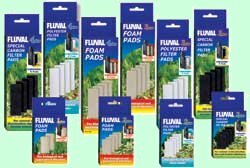 Additional filtration for many different aquarium set-ups. Useful for creating extra currents in reef tanks. Driving Ultra-Violet Sterilizers (reduction of particulate matter, increasing U.V efficiency). Providing filtration when external filters cannot be installed. These systems represent a common choice for most aquarium keepers. The general principle of operation involves the intake of aquarium water via a siphon that results in filtration through one or more filter media. The return flow is directed at the surface to provide oxygenation. There are various configurations of external filter systems. An important feature is that it should be able to mechanically, biologically and chemically filter water. In order to achieve maximum effect from the filter media installed, it is important to select a design that maximizes contact time with the filter media. This is easily evaluated when observing how and where water flow is directed within the filter. Fresh water aquariums generally require a minimum water turnover rate of approximately four times an hour. Marine aquariums usually do best with water turnover rates of 7 to 10 times per hour. Exceptions do exist with respect to the livestock being kept. In general, it is best to select a system (s) which provides somewhat more than the minimum rate. This will help compensate for declining flow rates as the filter system accumulates debris. Common types of filter systems that conveniently hang on the rear of an aquarium, efficiently filtering and oxygenating, while allowing easy access for maintenance. There are two basic types of systems, one employing a cartridge design, the other with a media compartment designed to accept multiple filter media. Systems which allow greater filter media choices generally offer more complete and versatile filtration. The AquaClear Power Filter represents one of the most versatile hang-on filter systems available. Five models provide a complete selection of flow rates for most popular sizes of aquariums. Contact time with the AquaClear filter system is maximized due to the innovative re-circulation grid and multifilter media stacking. The re-circulation grid allows water to be passed through filter media more than once when slower flow rate adjustments are selected, allowing superior contact time and significantly contributing to water quality. AquaClear Filter systems incorporate the exclusive CycleGuard Insert System which ensures that all filtration requirements are fulfilled by providing three distinct filter media. This ensures continuous biological filtration as one insert is replaced at a time, while the remaining filter media supports the re-establishment of essential bacteria (along with a dose of Cycle). 1) Particulate debris removal and optimal water distribution patterns, allowing subsequent filter media to perform at full efficiency. 2) Biological filtration, due to the porous structure of foam, providing surfaces for beneficial bacteria. Middle AquaClear Ultragrade Carbon Insert, Fluval Peat, Phos-X, and other chemical filter media are used to adjust and purify water. Top AquaClear Ammo-Rid or Bio-Max, effective at controlling harmful nitrogenous compounds such as ammonia, which is produced by various sources within the aquarium. Greater volume of filter media. Greater variety of filter media. 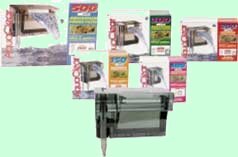 Superior contact time of aquarium water with filter media. Flexibility for the filter placement. Superior biological capacity, can support higher fish populations. Fluval MSF External Canister Filters provide complete filtration for most aquariums.These innovative filter systems incorporate features that are designed to facilitate aquarium maintenance and provide excellent water quality. Aqua-Stop � quickly disconnects water with the flip of a lever to allow easy access to filter contents. Multi-Media baskets - a variety of filter media are easily installed or removed, to provide optimal conditions for most types of aquarium set-ups. Large pre-filtration sponges that provide a large surface area to trap enormous waste loads, helping maintain filter flow rates. Opaque Ribbed Hosing - eliminate kinks, for easier set-up and no algae growth within the hose supporting better long-term flow rates. Water flow design maximizes contact time. Incoming water is immediately directed through large pre-filtration sponges and is vertically forced through multiple media baskets.